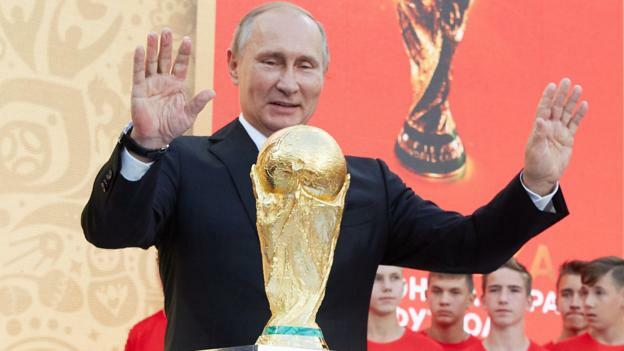 Russia will “fight until the end” even though they head into the World Cup in poor form, says the host nation’s president Vladimir Putin. As hosts, Russia automatically qualified but they are the lowest ranked of the 32 teams at the tournament and without a win in 2018. Russia launch the World Cup on Thursday when they face Saudi Arabia at the Luzhniki Stadium, Moscow, (16:00 BST). “Our team have not achieved big results in recent times,” said Putin. Russia’s last win came on 7 October when they beat South Korea 4-2 in a friendly in Moscow on 7 October. Since then they have lost to Argentina, Brazil, France and Austria, while drawing with Iran, Spain and Turkey. However, Putin expects Stanislav Cherchesov’s side to raise their game with a population of 144 million willing the hosts on. “We very much expect – all fans and lovers of football in Russia – expect the team to play with dignity, for them to show modern, interesting football, and to fight until the end,” added Putin. Russia are ranked 70th in Fifa’s world rankings – three places below opening opponents Saudi Arabia. After Thursday, Russia move to Saint Petersburg to face Egypt on 19 June (19:00 BST) before rounding off their Group A programme against Uruguay in Samara on 25 June (15:00 BST). Cherchesov knows his players need to discover some confidence. “I am not a therapist able to reassure anyone,” he said after a 1-1 draw against Turkey on 5 June.